and is among the few priests from India who will be concelebrating Mother Teresa’s historic canonization mass along with Pope Francis in Rome, on Sunday. He recalls the aftermath of the Second Vatican Council in 1971, when the Catholic Church was witnessing crisis and many new reforms were bringing in radical change among the clergy and lay people. At the time, Pereira was a young priest, hardly four years into the ministry of the priesthood. “Within four years of my ordination six of my fellow priests quit priesthood and got married, celibacy being the major problem facing clergy at that time. I, too, wished to quit priesthood since two of my close colleagues committed suicide. But, providentially I met Mother Teresa,” he says. Pereira asked her to pray over him. She told him she would not pray over a priest. Instead she held his hands and walked him into her chapel where she said a prayer with him. “I broke down like a child. Mother said to me after the prayer ‘Don’t think of quitting…Jesus needs you…it may take a long time…even ten years!’ That was truly prophetic, for exactly ten years later I got the inspiration to start Kripa Foundation,” Pereira says. Mother Teresa inaugurated Kripa Foundation in Vasai in 1994 and handed over the Boy’s Town orphanage in Gangarampur, North 24 Parganas district, Kolkata, to Kripa Foundation. She also had the Italian Consul inaugurate the facility. “Her visits to Bhivandi, a town devastated by communal violence in 1984, and then to Dharavi in 1991, were deeply touching. She walked in the midst of groups of people while their houses were on fire, carrying helpless children and calling for peace and love amidst people of all communities,” he recalls. Her greatest gift to Pereira as a priest was her sense of “total dependence on the loving providence of God. Even though there was no food on some days, even for her own nuns, their faith and prayer would miraculously make things happen and both nuns and inpatients would get their ‘daily bread’,” he says. Her guiding spirit were the words from the Bible ‘As long as you did it to the least of my brothers and sisters, you did it to me’ and her daily prayer was ‘Make me worthy Lord to serve fellow humans who live and die in poverty and hunger; give them through our hands the daily bread they need; and by your love and mercy grant me peace, Pereira says. One of the largest NGOs working in the field of rehabilitation of drug addicts, alcoholics and HIV/AIDS, with 65 facilities in 11 states and six countries, including a de-addiction centre at Anjuna, Kripa Foundation has helped many turn their lives around and become productive members of society. From the above account there can be no doubt that Mother Teresa wholeheartedly endorsed Fr. Joe Pereira in his propagation of Hindu yoga through his KRIPA Foundation. What does Fr. Joe Pereira do when he gets to Rome where the foundations of the Catholic Faith and the relics of some apostles, St. Paul, numerous saints, and the early martyrs are the places to visit and pray? He indulges in his Hindu yogic meditation. 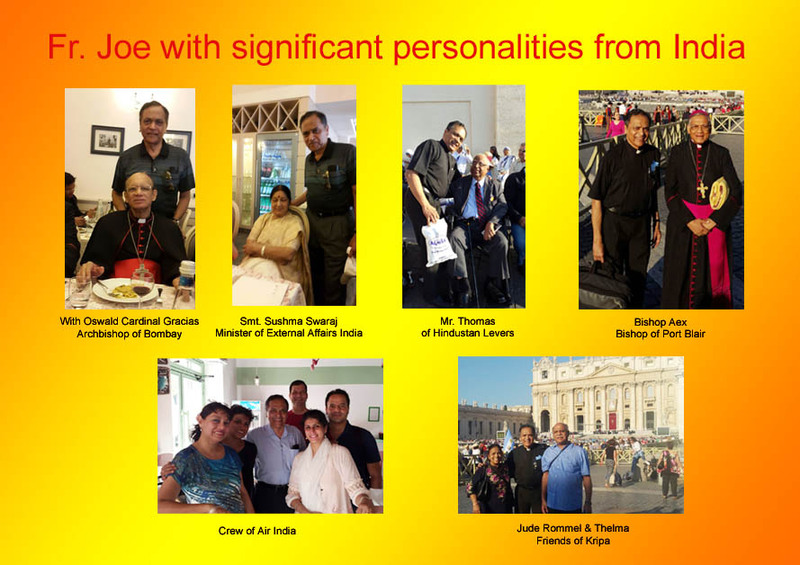 It was a great honor for Kripa, as our Managing Trustee Fr. 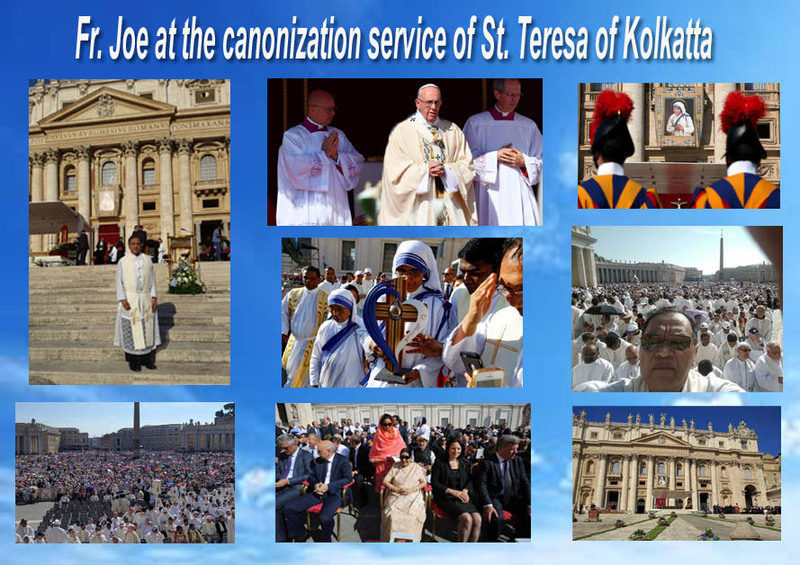 Joe H Pereira who was very close to Mother Teresa, had the honors to concelebrate at the Canonization service and Mass in St. Peters Square, Rome. Also present was His Grace Oswald Cardinal Gracious who is also our Trustee of Kripa Foundation. There are several photographs of him standing behind dignitaries (and even with the Air India crew) for the photo-ops, but none of him actually concelebrating at the altar with Pope Francis. There are a total of 14 photographs at the above blog but not a single one of Fr. Joe Pereira at the altar. WORLD COMMUNITY FOR CHRISTIAN MEDITATION-A. I. The following two are already on that list but are included here because Fr. 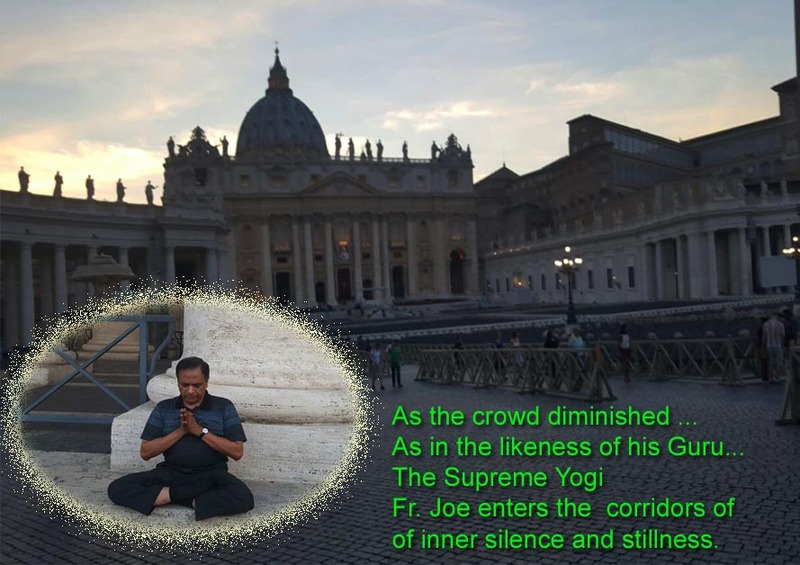 Joe Pereira is conveying to us (pictures taken in Rome at the canonization) how dear he and his yoga mission are to their hearts.